I’ve gone through many different schools before finally finding myself in hotel management studies at the Institut Notre-Dame Heusy. I am what I am thanks to my parents letting me live freely during my childhood. Even if my education at home was strict, my parents also wanted me to live out my own experiences. Above all, my children! Perhaps an easy answer, but they’re the reason I’m constantly looking to better myself. I’m rarely satisfied with myself – I’m well aware that I’ve accomplished a lot of things despite my young age, but I’m still always looking for that drive. Our uniqueness and singularity. Never taking ourselves too seriously, and a humour that others are envious of. Belgium makes you feel free; like you can do anything you want. The singer Arno, for his typical Belgian attitude and great talent. The actor Benoît Poelvoorde, for having successfully “exported” our Belgian humour. The singer Stromae, for his creativity and having brought a breath of fresh air to the global music scene. L’Air du Temps in Liernu, run by the chef Sang-Hoon Degeimbre. 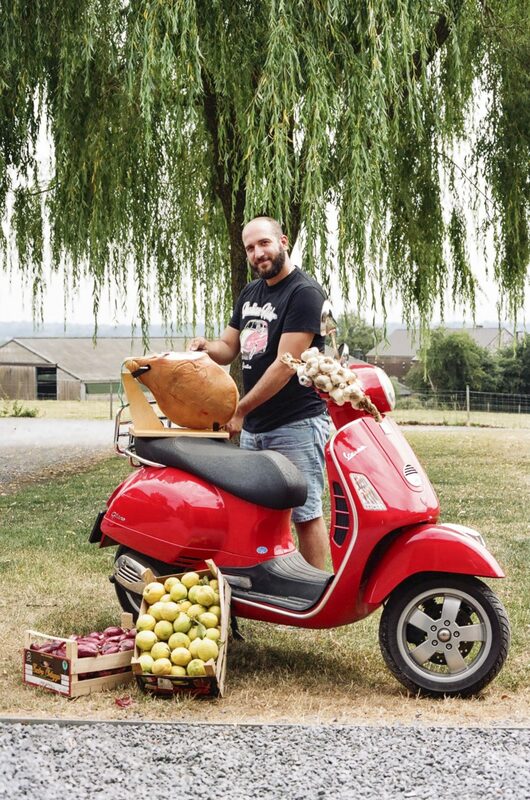 I admire his techniques, his respect for the products used, his garden which is easily ranked as one of the best in Belgium, and for finally putting Walloon cuisine on the map. To Liège’s city centre and its traditional Sunday market Marché de la Batte, finishing off with a beer on Liège’s most beautiful terrace at Brasserie C.
It was the Dallas, at a food truck festival. It was love at first taste! What do you call an armed Belgian in a wheat field? A cereal killer! Because we’re never serious and love to party. Waar is de feestje, hier is de feestje!